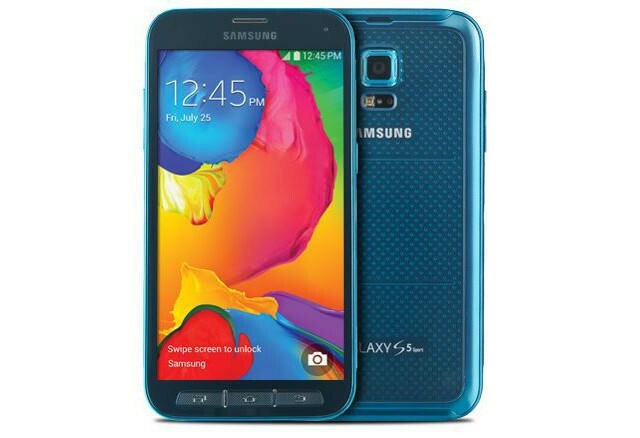 Sprint and Samsung on Monday officially announced the Galaxy S5 Sport that will launch on Sprint starting July 25 with custom software features and two unique colors that are exclusive to Sprint. The device comes pre-loaded with a software package called “Sprint Fit Live,” that’s powered by NQ Mobile. Fit Live includes quick access to health-focused apps like MapMyFitness MVP, which comes with audio coaching, training plans and more. Also, with underlying tech from NQ Mobile, it offers a dynamic wallpaper with inspirational quotes, quick access to Spotify playlists and aggregated information from Samsung S Health. Also, like with the HTC One (M8) Harman Kardon edition launch, the Galaxy S5 Sport comes with six months of Spotify Premium for free. Like the Galaxy S5, the Galaxy S5 Sport is IP-67 resistant and can be submerged in up to 1 meter of water for up to 30 minutes. It’s not shockproof like the Galaxy S5 Active, however, and looks like a totally different phone. Unfortunately, neither Sprint nor Samsung provided information on the internal hardware, but we’ll fill you in when we find out more. The Galaxy S5 Sport will be available for $0 down with 24 equal monthly payments of $27.09 and will launch in electric blue and cherry red. You can hit the source link to register for more information on the device soon.